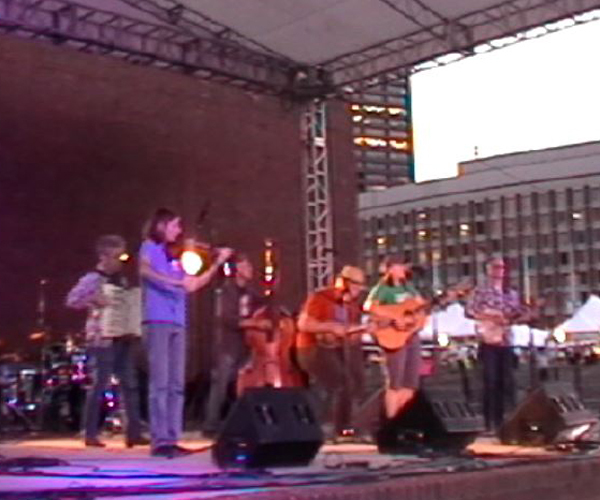 Creek River delivers an energetic and eclectic mix of bluegrass, country, folk, old-time, Tex-Mex, Celtic, blues and rock. Or as we like to say, fresh-baked roots music. We’re a five-piece acoustic band featuring guitar, fiddle, banjo, accordion, and bass with two voices balancing out the strings and bellows. We play whatever songs make us tap our feet and highlight the individual talents and interests of the band members. In any given set, you’ll likely hear originals, bluegrass standards, country waltzes, smokin’ fiddle tunes, driving rock songs, a few spicy Tex-Mex numbers, some funky blues, and a folksy ballad or two. We tinker with songs like a mechanic lovingly tinkers with an old truck and experiment like a chef trying to perfect his favorite recipe with a little extra cardamom. We’d love your opinion. How does she run? How does it taste? We play music festivals, bars, restaurants, clubs, cafes, coffeehouses, colleges, weddings, hayfields, private functions, and just about anywhere else. Repertoire and band size can be customized to suit your venue and musical tastes. For more information follow the “contact us” link. We’d be happy to answer your inquiry. The Burren – Backroom, Atwood’s Tavern, Square Root, The Lizard Lounge, The Cantab Lounge, Sally O’Brien’s, Precinct, Bela Luna Cafe, The Midway Café, John Harvard’s, Sandywoods, Thirty-One Main, Joe Val Bluegrass Festival, Boston Greenfest, Wake up the Earth, Saint-Gaudens National Historic Site, Titus Sparrow Park, Roger Williams University, the Brown University Folk Festival and Endicott College.